Surrounded by a landscaped garden of Mediterranean bush plants and flowers, the Quinto Moro has been built in the traditional style of the ancient Campidano farmhouses: floors in cotto tiles, beamed ceilings, fixtures, fittings and furnishings in solid wood, ceramic and wrought iron, all made according to tradition by skilled local artisans. The three beautifully designed rooms, all with en-suite bath and private balcony, offer stylish hospitality and a splendid mix of simplicity and charm. They are decorated with hand-loom tapestries, wrought iron beds and hand-embroidered sheets, and offer a splendid view over the pine wood or the garden. Air conditioning and central heating – individually controlled. Common-use areas for guests: the main hall with open wood-burning fireplace, a comfortable mezzanine lounge area and a veranda with a splendid view over the pinewood. The main hall also serves as breakfast room during the colder months, while the space near the fireplace is ideal for a cosy chat with your hosts or to read a good book. 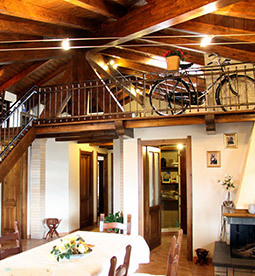 The mezzanine (the typical "intabau" of Sardinia) is a comfortably furnished lounge area for relaxation, with a selection of books by Sardinian authors (Grazia Deledda, Giuseppe Dessì, Giovanni Lilliu, Antonio Gramsci) as well as tourist guide books. This area, furnished with comfortable sofas and equipped with digital TV and home theatre, can also be used for small meetings. In fine weather, breakfast is served on the terrace, one of the most appealing areas of the Bed and Breakfast Il Quinto Moro: typical ceramic tiles and hand embroidered linen table cloths accompany dishes made from genuine locally sourced ingredients. In the evening hours, savour a local myrtle liqueur while enjoying the view over the pines and the cool breeze carrying the scents of the Mediterranean brush.